Everything was better in the old days. In terms of skin, yes! Each year the skin loses its moisture and elasticity. Factors such as stress, pollutants and sun rays accelerate the aging of the skin. 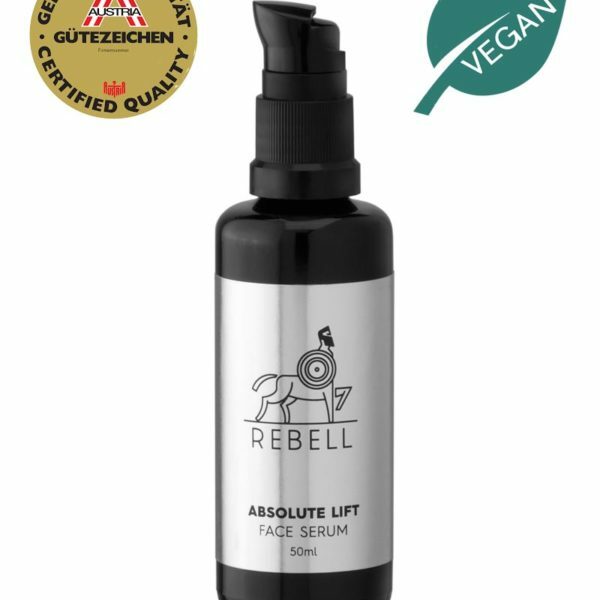 The highly effective face serum of the exclusive REBELL ABSOLUT LIFT line turns back time and rejuvenates the whole appearance. The basis of this sensational effect are the exquisite ingredients. Lean back and let it do its magic. Or read for yourself from where REBELL got its natural powers from to revitalize the skin. Biological coconut oil and aloe vera gel are deeply moisturizing. Squalane origining from olive oil, biological shea butter and the storage carbohydrate levan keep the skin soft, even and tight. The plant sap of the acacia tree and high-quality wheat germ oil smooth and reduce creases or pigment spots. Extracts from biological pomegranate and olive leaves work antioxidant and boost the cell renewal. Rhizobian gum longly protects the skin from drying out. Biological seabuckthorn oil and sunflower oil regenerate the skin long-term and provide vitamins, unsaturated acids and nutrients like zinc, iron, calcium, magnesium and potassium. Biological Comfrey extract stirs up the cell structure due to its high amount of allantoin. Biological rosemary extract improves the oxygen supply of the skin. 5 years younger in only 4 weeks. Can it be any better? 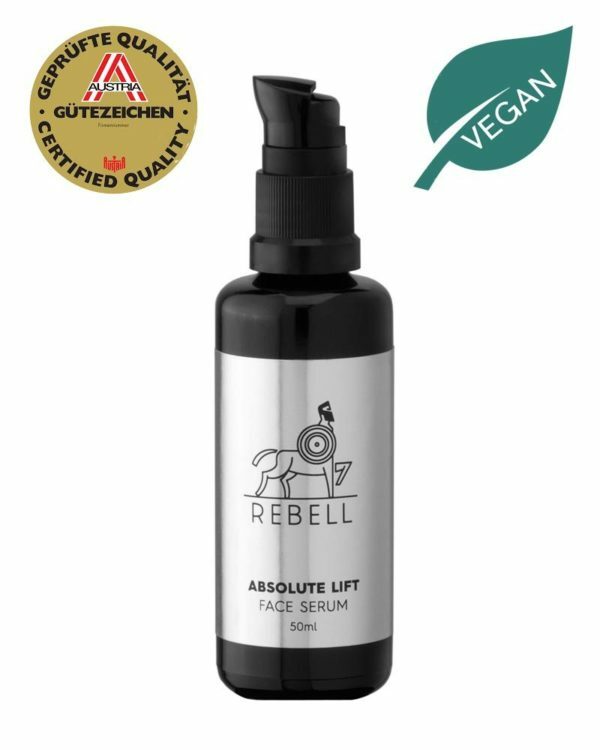 The exclusive REBELL ABSOLUT LIFT line combines first-class ingredients and innovative ingredient complexes, actively working against the sign of the time. The highly effective product line targets skin aging, cell stress and dehydration. The skin profits from an incredible freshness boost, thus being more resistant towards environmental stress and rejuvenating itself – already after the first application. Fine creases vansich, while the skin wins back its evenness. The REBELL ABSOLUT LIFT line is not a miracle but it works wonders with its excellent composition of excellent ingredients, which show their full potential. 5 years younger in 4 weeks is not a vague promise, it’s an explicit prognosis based on cosmetic laboratory tests of the ABSOLUT LIFT line. After only four weeks, the outcome is already visible: The skin is much tighter such as your appearance, having you smiling in front of every mirror.